Five undergraduates doing research at UC Santa Cruz were recognized for outstanding research presentations at the 2014 SACNAS National Conference, the largest STEM (science, technology, engineering, and mathematics) diversity event in the country. The conference, held in Los Angeles in October, featured a total of 918 undergraduate student presentations, and awards were given in eight multidisciplinary categories. The winners include two current UC Santa Cruz undergraduates and three students from regional community colleges engaged in research projects at UC Santa Cruz. 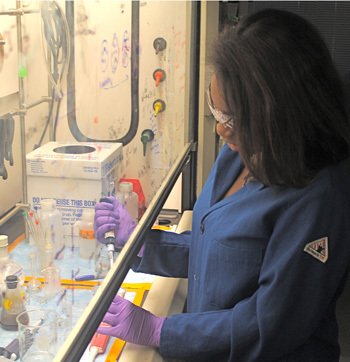 Sharon Idiga, majoring in molecular, cell and developmental biology at UCSC, was recognized in the category of Cell/Molecular Biology for her presentation on a "Peroxynitrite-Generating Platform." Her adviser is Pradip Mascharak, professor of chemistry and biochemistry. 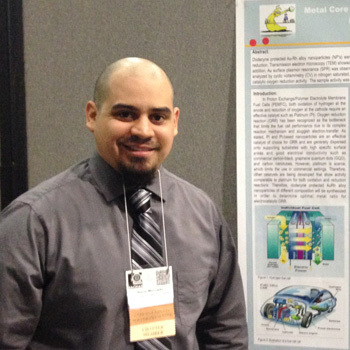 Rene Mercado, a chemistry major at UCSC, won in the Chemistry category for his presentation on "The Effect on Various Capping Ligands on Rhodium-Gold Alloy Nanoparticles for use in Electrochemical Reduction." His adviser is Shaowei Chen, professor of chemistry. Michael Sanchez, currently at Cabrillo College, was recognized in the category of Biochemistry/Biophysics for his presentation "A Deeper Sleep and a Brighter Day: Determining the Structure of the BMAL1 Protein Switching Region." His adviser is Carrie Partch, assistant professor of chemistry and biochemistry at UC Santa Cruz, who studies the circadian rhythms that control the body's 24-hour cycle. Jazel Hernandez, currently at Hartnell College, also won in the Biochemistry/Biophysics category for her presentation on "Quantifying Butanol Production of a Genetically Engineered Halophile." Hernandez is part of a UC Santa Cruz team participating in the iGEM (international genetically engineered machines) competition, advised by David Bernick, a research associate in biomolecular engineering at UCSC. Jhanic Ramos, currently at Hartnell College, won in the Engineering category for her presentation on a "PV Cleaner Robot." Ramos is working with UC Santa Cruz graduate student Zachary Graham on a long-term project to develop a robot for regular cleaning of solar panels. Their adviser is Michael Isaacson, professor of electrical engineering and director of the Center for Sustainable Energy and Power Systems at UC Santa Cruz. SACNAS (Society for Advancement of Hispanics/Chicanos & Native Americans in Science) was founded over 40 years ago by career academics and research scientists committed to unifying their voice and offering guidance to underrepresented minorities in STEM fields. Today, the SACNAS national conference is an annual gathering of nearly 4,000 students and professionals. The three-day event showcases both undergraduate and graduate student presentations and offers scientific symposia, keynote addresses, professional development sessions, and an exhibit hall in which students can interact with over 600 program representatives from colleges and universities across the nation. The conference is an opportunity for students to present their research in a professional setting focused on mentoring. Malika Bell, director of the UCSC STEM Diversity Programs, said there were over 50 students from UC Santa Cruz represented at the SACNAS conference. "Each one of these students is a highly accomplished emerging scientist—many of whom have overcome great obstacles to pursuing higher education in the STEM disciplines," Bell said. "The SACNAS conference gave them an opportunity to share their success in the lab and connect with a national community of mentors who will invest in their continued achievement." SACNAS and UC Santa Cruz have had a long shared history. Founding members and past presidents of SACNAS include UCSC scientists Eugene Cota-Robles, Frank Talamantes, and Clifton Poodry. In 2011, UCSC was a gold sponsor of the national conference. Of the 15 full-time SACNAS staff members in Santa Cruz and Washington, D.C., seven are UCSC alumni.